Recently, I attended a slide-driven, passive ½ day training ‘workshop’ that was really a presentation. It amazes me just how many people confuse presenting with training. I’m not implying that presenting is a dry, slide-driven talking at, by making that comment. I think a lot of people are reasonable presenters – and presenting is often about the spotlight, and how you as presenter, will fill it. 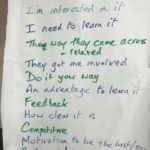 I decided to write a quick guide to adult learning for trainers in the hope it gets them away from content driven delivery. A colleague of mine ran a Train the Trainer course, and he asked a group of engineers “What has enabled you to learn something effectively in the past?”. This was just one group of learners. What are the implications to us as learning practitioners? Adults prefer to come up with their own solutions to problems rather than have content heavy training. The engineers who answered the question posed by my colleague aren’t aware of Knowles’ Adult Learning theory, yet their answers cover the 4 principles. How interesting. What can we do to get away from content-driven, slide heavy presenting, into engaging adult learners? My tip here is to involve your learners in their learning process as soon as you can. Gone are the days when a course sponsor told us needs, and what content to deliver. What are their reasons for wanting to attend? What is the ‘gap’ from where they are now, and their desired future performance? Are you sure it is a training need? Invite learners to start engaging with the subject before the event. Open up Yammer, Slack or a closed Facebook group and ask questions to get them engaged with why they are attending. Example – if I am facilitating a Leadership event, I may ask ‘What leader do you admire? Research them – their words, behaviour, and outcomes from their actions. Be ready to share your research when we next meet.’. Example – You’ve nominated yourself for the Managing Absence course. I’d like you to write ‘When I attend this course…then I will be able to…”. To clarify if it is a training need, ask ‘What is stopping you from doing this now?’. For absence, a training need may be “I don’t know how to frame a conversation. I don’t know legally what I can say and what I can’t say.”. This is a training need. For absence, a non-training need may be “I’d rather put up with the occasional absence than lose any of my team. My Boss never supports me on these issues anyway.”. This is not a training need. Lots of research suggests we learn by the experience of having a go, reflective learning, then having another go. As budgets have got squeezed, some half day training has so much content in it now. I attended an event that promised ‘practical tools’, and yet there was no opportunity to do, get feedback, and then do again. If trainers could move away from the content for the sake of experience, then training results would improve. I was asked this question at a recent seminar I facilitated on Minute Taking. The learner said ‘I don’t think I can justify a day out of the office to learn Minute Taking, as I will probably never get asked to do it.’. Of course, there is a bit of education needed on point 1 above for the course sponsor, however what I did was to ask ‘Who in the room does Minute Taking at the moment?’, followed by ‘What are the skills of an effective Minute Taker?’. Once we had a comprehensive list of skills, I then asked the learner ‘It’s your day, and you need to decide the best way to spend it. Will your time be well spent here?’. They said yes, and thanked me for a really useful day. Case studies can be really useful, and can drive lots of good learning points. However, the best case studies come from the learners own experiences. It goes back to point 1 – if the learner is driving their own learning, then use their problems so they can come up with their solutions. I ran a Customer Service Recovery course a while ago. My internal course sponsor had designed very detailed case studies. When I read them, they seemed too contrived to get the learning points she wanted. I asked her ‘What learning points do you want from your people?’, and I got a rather robust response. ‘I want them to look at how they handle complaints, and she listed each learning point she expected from each.’. Who is driving the learning here? I suggested to ask each person to write a list of the complaints that have dealt with – from the most common complaint, to the most awkward to handle. Each person then chose what their top three complaints were that they have personally dealt with. They then worked in groups of three to come up with ways they could handle these. I used a conference café approach to get each group to move around, to see if they could come up with further options. This left me as a trainer to observe, give feedback, add anything in that they may have missed, and to answer their questions based on my know-how. All of us at The Development Company are on a mission to save the world from boring learning – whether that is face to face learning, or elearning. 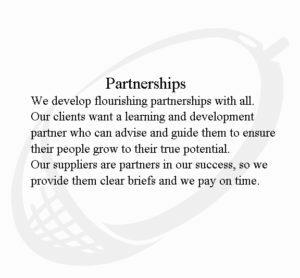 Talk to me about designing and delivering a session to your people based on adult learning principles. We have a level 5 Training qualification that follows all 4 adult learning principles. It is engaging and pragmatic in focus. Contact us if you’d like to get a professional qualification.